Youth awareness trip participant at St. Peter Clavier School in JamaicaFor thirty years, local organization Jamaican Self-Help (JSH) has been working to empower people and build communities. Through partnerships with hard-working Jamaicans, vocational centres, schools, health care facilities and other institutions, JSH has successfully improved the lives of many Jamaican adults and children. The community of Peterborough is an essential part of the success of this organization. Supported by the small but committed staff, the organization is based on Hunter Street in downtown Peterborough. Hundreds of Peterborough residents have participated in the activities of JSH as they lead, promote, educate and fundraise for the organization’s activities. “The mandate of JSH is twofold," says Marisa Kaczmarczyk, Executive Director of JSH. "Our objective is to work with our Jamaican partners in order to successfully do as our slogan suggests—‘Empower People and Build Community’ in the Jamaican context. We also work to promote global education for Peterborough residents through a number of activities and events, thereby ‘Empowering People and Building Community’ in the Peterborough context and between these two countries, as well." Local couple Rosemary and John Ganley founded the organization after traveling to Jamaica in the 1970s through their volunteer work with the Canadian International Development Agency (CIDA). 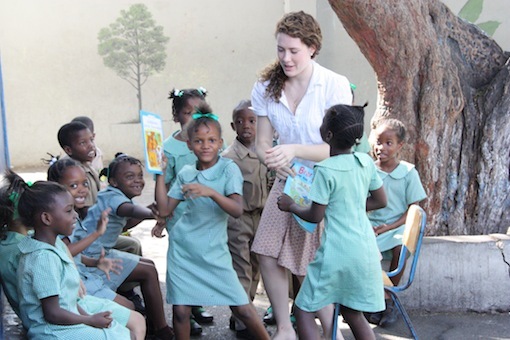 With the help of friends and community members, the Ganleys have remained advocates for the organization’s activities in Peterborough and its programs in several parts of Jamaica. Other Peterborough residents continue to support JSH through volunteer work in areas such as fundraising, global education, programming in Jamaica and event planning. The organization continues to lead students and adults on "awareness trips" to Jamaica that promote knowledge of international issues. As JSH looks into the next thirty years of its work, Peterborough remains significant in all aspects of its activities. “The support that JSH receives from the residents of Peterborough is essential to its success," adds Kaczmarczyk. "We rely so heavily on the volunteer hours, the corporate support, the public and private donations that we receive from the people of Peterborough. We continue to grow as an organization because of new ideas and support from members of this community of all ages." To learn more about JSH, go their website, follow them on Twitter @JamaicanSH, or contact the office at 705-743-1671.